Romantic Deception is a hot topic, so much so that you’ll often hear it discussed on talk shows and news magazines like Dateline, 20/20 and 48 Hours. The key element in all the discussions and shows is the notion of impostors — people who are not who or what they say they are. And the truly troubling element is that an impostor can show up anywhere — online, at the supermarket, at work, or even at church. Because the very organization of society rests on the notion of a truth bias, we are very much inclined to believe people are telling us the truth when they discuss their personal biographies. In short, we are inclined to believe what people are telling us. Accordingly, victims or targets of Romantic Liars come in all shapes, sizes, and forms; targets of deception are not necessarily lonely people longing for companionship. Secure, strong, independent individuals (both men and women) are often the targets of Romantic Deception. Most of us are, according to Dr. Sally Caldwell, author of the book Romantic Deception: The Six Signs He's Lying, socialized to tell the truth. The socialization comes in the form of lessons laid down early in life — lessons about the importance of telling the truth. As a result, it is very difficult for someone who places a priority on honesty to believe their most intimate partner is an imposter. Whether it is a lie about education or occupation or marital status or military history (and the list goes on), the person on the receiving end of the lie often undergoes a life-altering experience. For some, it is akin to having spent time in a cult, particularly if the Romantic Liar is overly controlling (something that is very often the case). There are ways to discover if your potential mate is all that he or she claims to be, and some of those strategies and methods are outlined in Caldwell’s book. If you think you might be in a deceptive relationship, this book is a must read. If you’ve been a victim of Romantic Deception, you’ll find some illuminating information about the life-course of deceptive relationships — how they start, how they play out, and how they typically end. The highly acclaimed Romantic Deception: The Six Signs He's Lying is based on scores of interviews with women involved with romantic liars. More than anything, the book provides a research-based examination of a very important topic. The second edition, published in 2010, offers an updated Survival Guide that provides tips and methods for conducting your own background investigation. 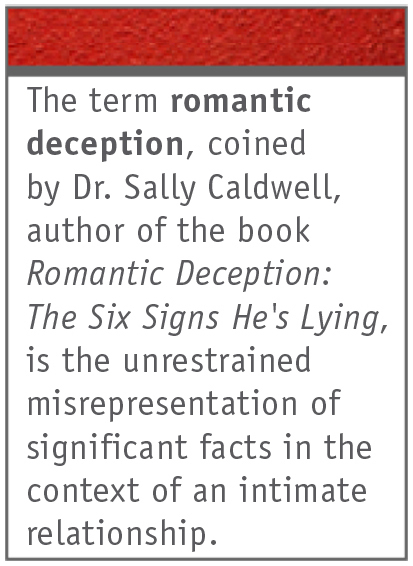 Download an excerpt of Romantic Deception: The Six Signs He's Lying. Order your copy today at Amazon.com. Romantic Deception is also available for download for the iPad from Apple’s iBookstore, the Kindle from Amazon, the Nook from Barnes & Noble and for the Sony Reader available at the Reader Store. This book is the most telling insightful book ever written about lying. It can happen to you (regardless of age, financial circumstance, education, looks etc.) ---that's the biggest thing to recognize---prepare yourself. I am buying this book for all of my single friends. I read it cover to cover and it gave me everything I needed to assess the situation, understand why it happened, heal, act, and prevent it again. This isn't a book about players or everyday scumbags you may be dating. If you are interested in con artists and how to verify information on a person, this book will clue you in. Read more reviews at Amazon.com.